Monday afternoon, I went by my grandparents’ grave site. We lost my grandmother when I was 11 and my grandfather when I was 14. Even though I lost both of them at a young age, I still have memories of them. And no matter how much it gets covered up, they will always have a piece of my heart. But loss caused and felt by death isn’t the only kind of loss possible. We can also lose a way of life or lose contact with people that we were once so close to. My parents got divorced almost six years ago. When they did, I had to say goodbye to the only life I had known. I then had to grow accustomed to a different way of life. A life with a bit more separation. I have also lost contact with most of the people I went to high school with, and even a number of people that I met in college. What does this have to do with God, though? 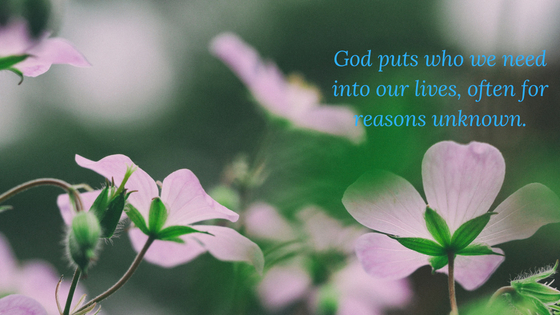 God most definitely has a reason for putting the people He does into our lives. They may be our support system during a difficult time. They may be the person who challenges us. They may be the person we fall in love with. They may be the person who becomes our best friend. They may be in our life to teach us something about God Himself. And I say that we may not know the reason why their in our life yet, because some lessons are learned in hindsight. The people may challenge us or help us to get to a certain point in our lives. Or they may teach us a lesson that we need to remember later and when we’re older. They may be there to teach us to trust God or others, which might come in handy later on. But so often, we don’t know what lessons they teach us until they are no longer in our lives. I have people that are still a part of my life and I know now why God gave them to me. Let me provide a couple of examples. My roommate of my last two years of college: I met her my sophomore year of college and when it came to booking housing for the next academic year, we decided to room together. I believe that God sent her to me to show me that I can share life with someone on such a personal level and still be able to joke ad have fun. And I think that it helped that we met at the Newman House there at Murray. So we knew we shared (and still share) the same faith and same core group of friends and were able to bond even more. Another example is one of my absolute best friends. I met her one of the first days on campus and she introduced herself despite my awkwardness. For the four years we were at university, she became one of my absolute best friends, and remains so today. (And I hope that remains a fact for the rest of my life life.) She has seen my ugly cry multiple times. She has had drinks with me on multiple occasions. She has shared her love for horses with me. She has lifted me up when I was down. She became my confidante. She has shared laughs with me and made some of my most cherished memories with me. Okay, you started this post talking about loss. Now you’re talking about people in your life now. You’re kind of sending mixed messages. My point is that we can have the luck to know why people are in our life while they’re still a part of it. But more often than not, we don’t realize why they were a part of our lives until we’ve said goodbye. What does goodbye look like exactly? A person can drift out of your life. Not having access to communication. Until we talk again, I hope you have a good day and a good rest of the week.